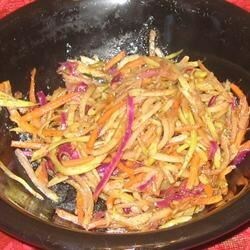 "This is a great quick side dish that is not the same old ho-hum cole slaw!" Heat a large skillet over medium-high heat. Spray with cooking spray. Cook the cabbage, red cabbage, and carrots in the hot skillet until they begin to soften, about 2 minutes. Stir in the garlic powder, onion powder, salt, and pepper. Continue to cook and stir until cabbage and carrots are soft, 8 to 10 minutes. Stir balsamic vinegar into the cabbage mixture just before removing from heat. I added a bit of sugar and more balsamic vinegar to give it more of a sweet and sour taste. I needed the extra vinegar as I had a very large head of cabbage. It was like an eggroll without the wrapper.